In the agriculture time, the New Year poster is a big custom of the Chinese New Year. The added values like the exorcism and blessings have made them special and meaningful because of its capable replication along with the strong humanistic spirit and nian atmosphere. The woodblock printmaking New Year poster springing up from Ming and Qing Dynasties is a leading figure of Chinese folk art. There are excellent posters across the country, including Tianjin Yangliuqing, Suzhou Taohuawu, Guangdong Foshan, Sichuan Mianzhu, etc. Among them, Shaanxi Fengxiang woodblock printmaking New Year posters rank first in the northwest region due to the fact that they are rooted in a rich traditional culture and unique in its bright colors and exaggerated plastics. The New Year poster in this region began in the Tang and Song Dynasties and reached its peak in the Ming and Qing Dynasties. During the period of Republic of China, it flourished and continued until 1949. Compared with others, Fengxiang woodblock printmaking New Year posters have rich characteristics of the northwestern region. The style is rough and exaggerated; the theme is clear; the shape is simple and concise; the color contrast is strong, and the composition is full-filled and well-proportioned. The characters on Fengxiang woodblock printmaking New Year posters are exaggerated and dynamic, well-illustrated in both body and soul, and vivid. Its use of color bases on the traditional Chinese philosophy of yinyang & five elements, using the basic colors as the majority, and pursuing a colorful and enthusiastic image to achieve an emphasis to each other. Fengxiang woodblock printmaking New Year posters have been produced and sold in the form of family workshops or slightly larger huaju (studios). The inheritance of the skills in those studios is also following a family way. 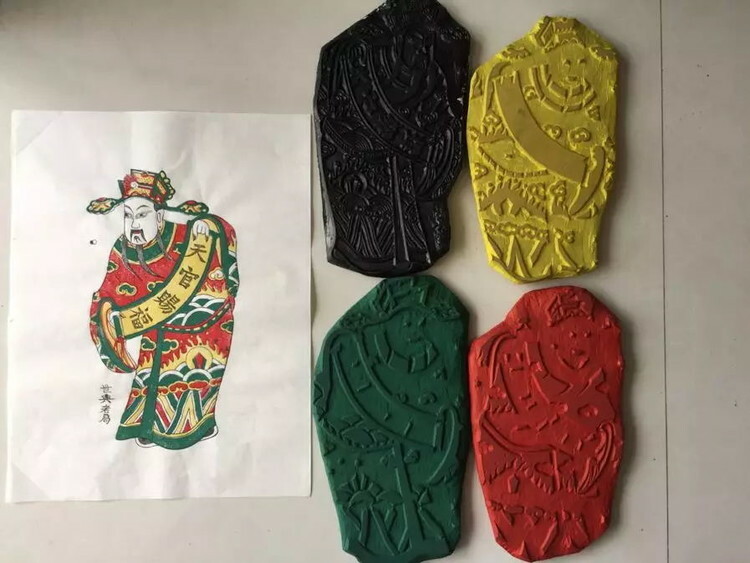 Among them, the Tai family has never been interrupted the inheritance of Fengxiang woodblock printmaking New Year posters since the Ming Dynasty. The production always begins after the autumn harvest, and finishes on the Qing Ming Festival of the second year. It takes about half a year to print, and the rest to engrave and prepare the raw materials. Fengxiang woodblock printmaking New Year posters evolved from the old-time on-door posters; with the development of the engraving printmaking industry, it gradually developed from the hand-painted to the woodblock printmaking. The early production method was to use monochrome ink printing, and was later developed to manually dye different colors after printing the ink line. The collapse of China agriculture time started in the late 19th century, and the woodblock printmaking New Year posters therefore declined. From 1880 to 1930, the New Year posters changed its form from the woodblock, the lithographs to the offset printing at the end of the 20th century. When the posters became offset printed, it meant that the woodblock printmaking New Year posters came to an end. At the same time, with the changes of the times and of habits, the New Year posters gradually lost their original functions. Fengxiang woodblock printmaking New Year posters also gradually lost their market competitiveness and nearly disappeared in the second half of the 20th century. For now, there is almost no woodblock printmaking New Year posters among 5 provinces in the northwestern region, except Tai’s family. 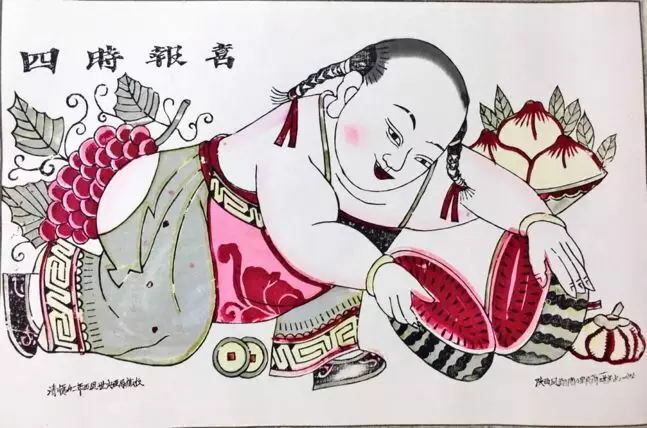 On 20 May, 2006, Fengxiang Woodblock printmaking New Year poster was approved by the State Council to be included in the first batch of national intangible cultural heritage. In recent years, our country began to focus on the protection of intangible cultural heritage. 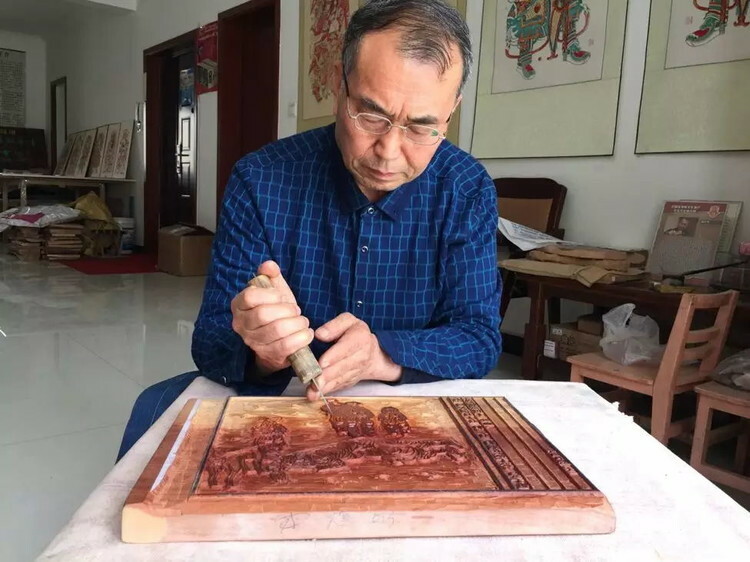 Tai Liping, as the twentieth generation of the Fengxiang woodblock printmaking New Year posters, has taken the responsibility of reviving this old technique, and made them rebirth and widely spread to home and abroad. Since the end of the 1950s, Tai Liping and his father have co-produced more than 60 new posters, excavating, collating, researching, and re-print more than 400 kinds/series of Fengxiang woodblock printmaking New Year posters, which made it recover to its standard level in the history. 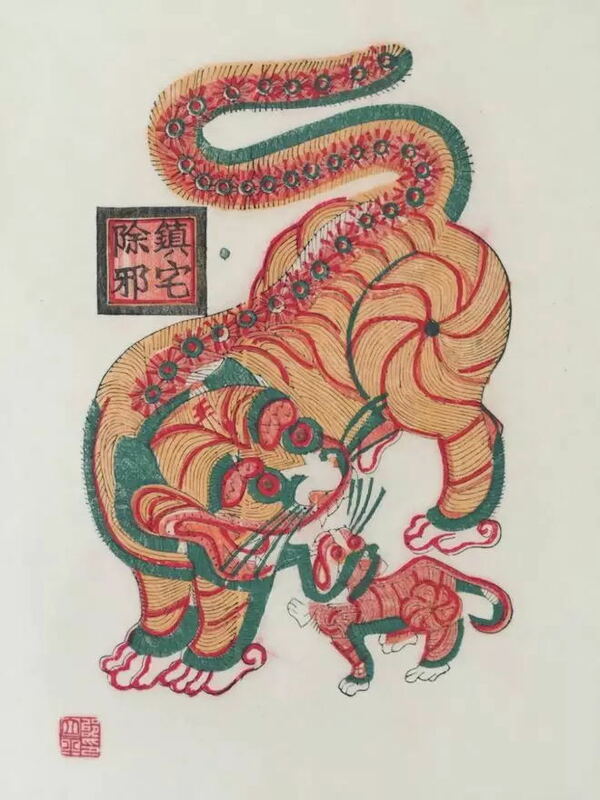 Tai’s restorations have been collected by the Central Academy of Fine Arts, Academy of Arts & Design, Tsinghua University, the National Art Museum of China, the National Museum of China, and other institutions in Japan, France, Germany, and the United States. Tai Liping was born in November, 1952 in Fengxiang, Shaanxi. He began to learn the Fengxiang woodblock printmaking New Year poster, a more than 500-year technique practiced by his family, from his grandfather Tai Shiqin from 6, and follow his father Tai Yi, a real master in folk art, at the age of 9. 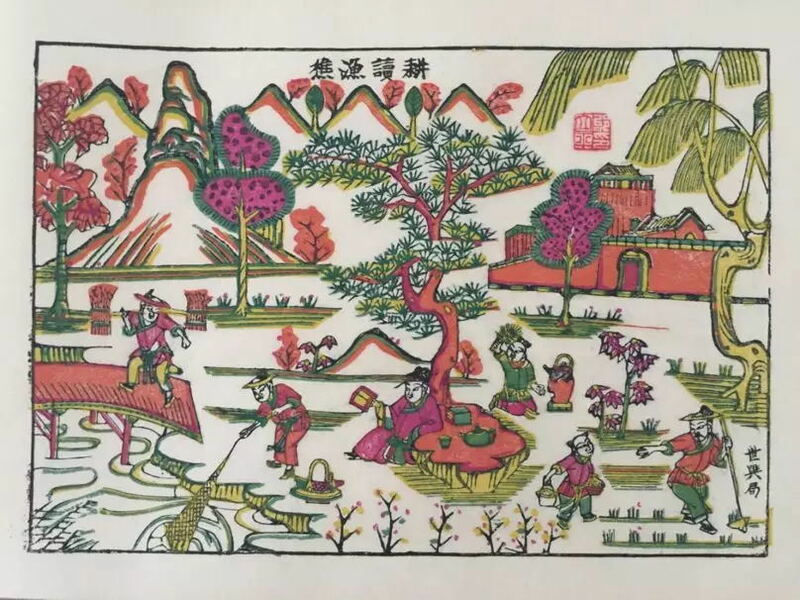 From 1958 to 1978, Tai Liping and his father have co-produced more than 60 new posters, excavating, collating, researching, and re-print more than 400 kinds/series of Fengxiang woodblock printmaking New Year posters, which made it recover to its standard level in the history. 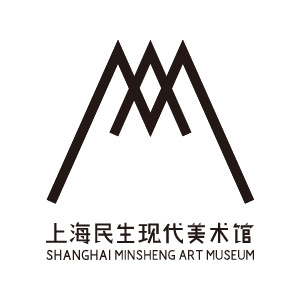 In 2005, Tai was employed as ‘folk art creator researcher’ by Chinese National Academy of Arts. In 2006, he was titled as Master of Chinese art & craft by National Development and Reform Commission. 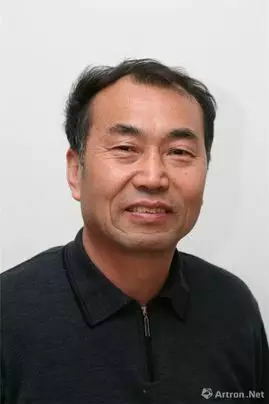 In 2007 he was titled as the inheritor of the first batch of national intangible cultural heritage by Ministry of Culture, the excellent inheritor of Chinese traditional culture by China Federation of Literary and Art Circles and Chinese Folk Literature and Art Association. In 2012 he was awarded as the successor of national intangible cultural heritage by Ministry of Culture and China Intangible Cultural Heritage. In 2018 he was employed as the Cultural Counselor by Xi’an government. He has edited and printed the Selection of Fengxiang Woodblock Printmaking New Year Posters. It is titled by Professor Zhang Ding and the preface is written by Professor Bo Songnian at the Central Academy of Fine Arts. The first two volumes has been published; 168 poster artworks have been collected, and it is called ‘a valuable category of Chinese folk art’.